It started as a dream and that dream became a reality when in 1955 Robert R. Linn, Sr. founded Bay Haven Yacht Club along with several area businessmen. Articles of incorporation were signed and Bob Linn became Bay Haven Yacht Club's first Commodore. The club by-laws were established outlining the governing of the club. Two years after incorporation, the club received their liquor license granted by the State of Michigan. Located at 1862 Ottawa Beach Road, Mr. Linn owned and operated a 40-slip marina, ship's store and a restaurant which was open to the public. In the early 1950's Bob was commissioned by the US Navy to build tugboats during the Korean War era. After the war ended, Bob turned his attention to building Roamer Yachts, a steel-hull luxury yacht that was later purchased and manufactured by Chris Craft. In 1955, Bob turned his attention to expanding the marina and developing the yacht club into what it is today. The founding fathers of Bay Haven Yacht Club sat down to design the club's burgee (a swallow-tailed flag used by ships for signals or identification) to represent the club. When leaving the club after sunset, members could see the dark sky and Big Dipper which would be in full view as you looked North. Bayshore Yacht Club's burgee is dark blue with 8 white stars, seven of which are the constellation Ursa Major (the Great Bear, or the Big Dipper) and the eighth being the North Star, stands alone. The blue background represents the sky, the sea and mountain lakes. The first year of existence, yacht club dues were set at $15.00 per year with an initiation fee of $25.00. As the marina grew in size, so did the yacht club. During the mid-eighties, the club boasted a roster of 700 members. Each night the club was open it was standing room only at the bar and impossible to find an empty table. Today, membership totals about 350. The club is open Wednesday through Sunday during the summer months and Friday nights during the off season. Many changes to the facility have taken place over the years. In the beginning, the club was housed in what is now the boaters lounge. The pool at that time was located next to the pump house, just outside the entrance to the lounge. As membership grew, the club relocated to its present site about the boaters lounge. Many renovations over the years have resulted in to what is now BYC. New stairs and entrance doors, expansion of the kitchen area, increased size of the bar area, enclosed deck and new windows has taken place over the past years. The bar is the only original structure that remains from the 1950's. Boat names painted on the bar top, walls and bar stools also depict some of Bay Haven and Bayshore Yacht Club history. During the 1985 club renovation, pictures of past commodores, which lined the back wall, were inadvertently destroyed. In 1989, Bay Haven Marina was sold to new owners. The name of the marina was changed to Bayshore Marina. 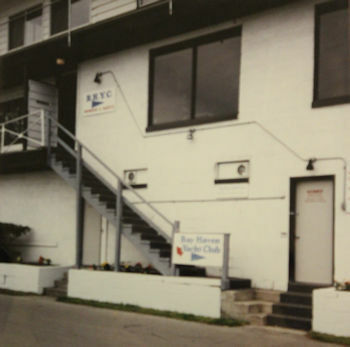 In 1991, the club's membership was polled whether to change the name of the club to reflect the marina's new name or leave it as Bay Haven Yacht Club. The membership voted to change the name; thus Bayshore Yacht Club emerged. Just a few years later, the marina was again sold. Now under new leadership, the marina became the Yacht Basin, which still remains. Rober R. Linn, Sr. passed away on May 30, 1994. Bayshore Yacht Club has developed into a friendly, family-oriented club whose members share in the pleasures of boating and relaxation.